You will earn 1,027 Reward Points. Earn 1 reward point for every 1 dollar spent. Popular Sizes: Work Centers come in 30" (760mm), 36" (910mm) and 44" (1118mm) widths and lengths of 60", 72" and 96" (1525, 1825 and 2440mm). All models are 34" (860mm) high. Stationary or Mobile: Standard units are stationary with leveling foot on each post. Work Centers are also available fitted with 5" (127mm) polyurethane swivel casters, two with wheel brake. Greater Rigidity: Work Centers features 15⁄8" diameter HD Super™ posts and the tapered sleeves and corners of patented Super Erecta Shelf® construction. These two features assure a rigid, wobble-free table. Easy to Assemble: Units are shipped knocked down and can be put together in minutes without special tools. Bottom shelf of frame is adjustable in 2" (51mm) increments. The table top fits over plastic sleeves at the top of the posts. Heavy-Duty: HD Super™ Work Centers are designed and built for heavy-duty applications. The work surface is made of seamless, 14-gauge stainless steel with an 11-gauge support structure that virtually eliminates any “drumming”. 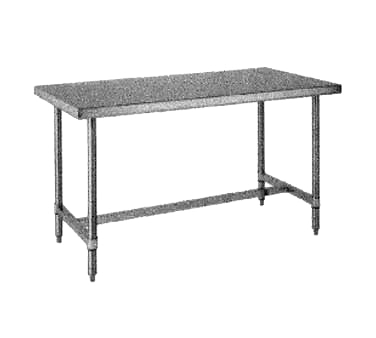 Several Styles Available: Versatile HD Super™ Work Centers come in 24 models, all with stainless steel tops, but offering a choice of chrome-plated or stainless steel posts and either a shelf or a three-sided frame which can be placed at the desired level below the top. Additional shelves can be ordered from HD Super™ stock. Top: Seamless 14-gauge T-304 stainless steel, with 11-gauge channel support, nickel/chromeplated after fabrication. Posts: Steel posts have an outside diameter of 15⁄8" (38mm), with rolled grooves in 2" (51mm) increments along entire height. Bottom Frame: Three-sided tubular frame available in 16-gauge chrome-plated or stainless steel. 30" x 60" (760 x 1525mm) work centers have 24" x 54" (610 x 1370mm) bottom frames; 30" x 72" (760 x 1825mm) and 30" x 96" (760 x 2440mm) work centers have 24" x 60" (610 x 1525mm) bottom frames. Bottom Shelf: 16-gauge galvanized for T-304 stainless steel. 14-gauge available on special order. 30" x 60" (760 x 1525mm) work centers have 24" x 54" (610 x 1370mm) bottom shelves; 30" x 72" (760 x 1825mm) and 30" x 96" (760 x 2440mm) work centers have 24" x 60" (610 x 1525mm) bottom shelves.